Your office holiday party looms on the horizon. You're moving up in the world, hoping for that promotion, and you want to impress all the right people. You've chosen your perfect black dress, and you have a gorgeous Indian yellow silk scarf, which you've learned just how to wrap so you look stunning. You've consulted your makeup artist, and you're set for understated glam. You've got tasteful diamond drop earrings, and you're leaving your neck bare in red carpet style. All you need to complete your look is a scintillating left hand ring. Why not consider this magnificent and massive 80-carat citrine cocktail ring? You can wear it on your power finger (that is, your index finger), so that whenever you point something out, your colleagues will see that not only do you make a good argument, but you also have brilliant taste. Rest assured, you'll be in good company with citrine, classically referred to as the Merchant's Stone or as I like to call it, the Stone of Sweet Success. Medieval merchants kept citrines in their money purses, believing their financial pursuits would be blessed by its power and presence. The ancients believed citrine harnessed the power of the sun, carrying its radiance and warmth into everyday life. The mystics of old believed it would dispel sadness, anger, and fear, opening the space around them to the abundance of the universe, ensuring that good things come their way. Do you want that promotion? Then count on the Merchant's Stone to energize you into full expression of your natural talents and gifts. Long believed to enliven creativity and spark the imagination, citrine just might aid you in transforming your dreams into tangible realities, resulting in a solid plan you can follow to reach your goals. You can choose to believe, like those who practice crystal energy healing, that citrine encourages fresh starts and brings fullness of life to those in pursuit of new horizons. Practitioners of gemstone healing and magic count on citrine to enhance mental clarity, personal discipline, and confidence, making it the perfect stone to wear when pursuing that promotion. Not only that, but citrine has long been hailed as a stone of joy. Who wouldn't want to pursue the next level in their career with joy, imparting enthusiasm to those around them, as well? Why not make your mark on your company and bring those around you along with you? Citrine is said to promote generosity. It could be called a Share the Wealth stone, as well as the Merchant's Stone. With all this latent positive energy connected to your power finger, you might just find yourself overcoming obstacles and blocks to your creative expression. It might just give you that leg up in winning over even the most stubborn of associates to motivate action and teamwork. Since every promotion is a team effort, why not allow the generous nature of citrine to encourage your acknowledgement of those who are supporting your promotion? Then, you'll have the loyalty of your team as you move into your new position. This beautiful ring might just be the motivation you need to get to work and make that promotion a reality. If you'd like to feel its power, we invite you to make an appointment with us today. 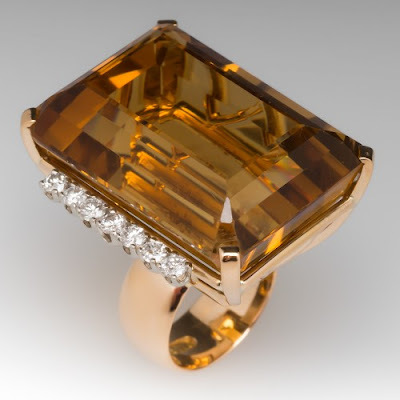 Try it on, see what 80 carats of citrine can do for you.